Srijan - Collection Of Tribal Paintings is an event that took place between 09-Feb-2007 and 15-Feb-2007 in Hyderabad. Here's a new statistic - there are 7 women in the Bhil and Gond tribes who can paint well. And a visit here should put an "at least" in that sentence. The Adivasi Lok Kala & Tulsi Sahitya Academy of Bhopal, Madhya Pradesh, in collaboration with Kalahita Art Foundation, is hosting an exhibition of paintings by the tribal artists of Madhya Pradesh. The exhibition titled Srijan will feature 66 selected paintings of the Bhil and Gond Tribal women artists. This is a large exhibition in which 7 tribal women are participating - Nankusia Shyam, Durgabai, Kalabai and Rambai of the Gond tribe, and Bhuribai, Ladobai and Bhuribai of the Bhil tribe. Tribal art is an impulsive expression owing to the experience of being in nature and that of natural living. Although ritual practices take up a key role, it is closely linked to food, well-being, health and survival. The uninhibited stylization of each tribal art form is colorful and vibrant, and redolent with the natural expression of people. The use of vibrant dots and lines make the paintings look different and appealing. In Bhil paintings, insects, birds, animals, plants and other complex aspects of life are depicted in the paintings and murals. Symbols of the sun, the moon, the lion, the bow and the arrow also are part of their paintings. The Bhils are culturally rich, and a reflection of their aesthetic tradition is noticed in their clothing and objects of daily use. The Gonds believe that trees stand central to life, and that the spirits of many things lie in them. They are full of activity all day, giving shade, support, shelter and food to all. Only during the night do they have time for rest. Contemporary life is also expressed through simply stylized forms. The use of natural colors in the shades of ochre, coal, indigo, chalk etc. instills sublimity in the paintings. 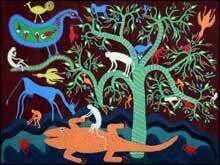 Gond paintings offer variety unlike other tribal art forms. The exhibition of these works will also run concurrently at the Chitramayee State Gallery of Fine Arts and Le Cafe D' Art till 17th February. For further details, please contact 2335-0543. Be the first to comment on Srijan - Collection Of Tribal Paintings! Just use the simple form below. fullhyd.com has 700,000+ monthly visits. Tell Hyderabad what you feel about Srijan - Collection Of Tribal Paintings!